Straight water with additive is not recommended on Northern Lights generator sets as they may cause damage to the engine. Some brands of Hybrid or OAT type coolants have been reported to cause the OEM thermostat to stick, leading to overheating. In addition, some extended life coolants have been found to cause leaks in the generator set’s pump seal. In such conditions, flush the coolant system thoroughly and refill with an approved Northern Lights coolant. All engines with wet liners require a supplemental coolant additive (SCA) to prevent liner erosion and pitting in the circulating water pump impeller. Northern Lights recommends heavy duty diesel rated coolants, which include an SCA. If a heavy duty diesel rated coolant is not available, add an SCA to prevent the symptoms noted above. It is the responsibility of the customer to understand that the use of incompatible coolant may cause damage, so please help educate them. Conventional Propylene Glycol based coolants. Conventional Ethylene Glycol based coolants. Please refer to your operators’ manual for your specific unit’s coolant requirements and specifications. Should you encounter of the above conditions, or have additional questions about Northern Lights coolant recommendations, contact your Factory Service Representative. 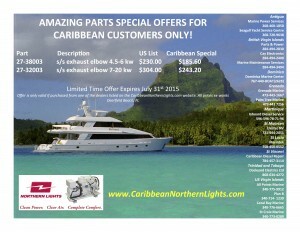 Northern Lights and Caribbean Distributor, Parts & Power Ltd of Tortola, will be hosting Service Training for Caribbean Dealers from 14-16 July in Road Town. 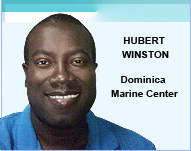 12 Caribbean dealers from 10 countries will participate in the training. The training will be put on by Parts & Power Director of Technical Services, Dan Durbin, and Northern Lights SE Regional Service Manager, James Newball. Dan has over 40 years’ experience in Diesel Electric Service training, having taught for such companies and Cummins Engine Co, Ford Lehman and Northern Lights. 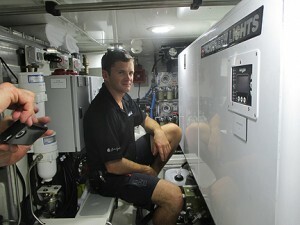 Dan served as Northern Lights International Service Manager and Service trainer prior to joining Parts & Power in 1993. He continues to put on factory sponsored Service and Product training in Florida 3-4 times per year. The focus of the training will be on current Northern Lights generator production, identification and serial number understanding; Northern Lights and CaribbeanNorthernLights.com website navigation; Engine troubleshooting & repair; DC theory, troubleshooting & repair; AC theory, troubleshooting & repair; Stand maintenance practices; Warranty training and processing; Marine exhaust systems; and a discussion of common and recent Service Issues. The purpose of the training is to make sure that all Caribbean Northern Lights dealer technicians have the most up to date training so they can better service Northern Light customers in the Caribbean. To that end, all dealers participating in the training will receive the prestigious “Golden Wrench” next to their name in the Northern Lights Dealer Directory. This indicates that dealer has undergone the most recent training procedures offered by Northern Lights. Click the image to download a PDF of this limited time offer – expires on 31st JULY 2015! Summer time is the off season for many in the Caribbean, whether you are a cruiser sitting out Hurricane Season or a Charter vessel taking a well-deserved break. 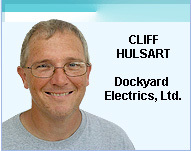 Before you put the boat up on the hard, or leave it at the dock for the summer, do your diesel engines a favor. Before you leave your hard working Northern Lights generator for the summer, be sure to change the oil. The oil is the life blood of your engine. It holds all the dirt, acids, soot and by products of combustion in suspension. That contaminated oil sits on all the surfaces serviced by your oil and expedite corrosion if left for prolonged periods. In addition, oil oxides when left exposed to the air, reducing its effectiveness at lubricating your engine and holding contaminants. So do your engine a favor and change the oil before you put it in storage. While you’re at it, why not do your Annual Maintenance? Annual Maintenance? What is Annual Maintenance? If you look at your Operator’s Manual, you will notice a section that says “Every 12 Months”. Everything in there is due every year. Generally this includes: Oil Change, Valve Adjustment, Air Filter replacement, Fuel filter replacement and Injector Testing. Check your manual to see if there is anything else included, but the above are fairly common with most diesel engines and Northern Lights generators. We discussed the oil change. Even if you don’t have the 200 or 250 hours dictated by the oil change interval, remember that oil oxidizes even if not being used. So changing oil makes sense, but why check the valves? Besides making sure that your engine is “breathing” properly in terms or air in and exhaust gases out, it also can pick up signs or engine wear. If the valve clearances are narrow, that can mean that the valve in question is wearing the valve seat. This may be a sign that your engine is getting ready for a top end overhaul. If caught early, this is fairly routine. If caught too late, the repair could be far more costly. You could be looking at a new cylinder head, or a “dropped valve” which can be catastrophic. You might think that, because your engine is clean, you don’t need to change your air filter. Many Northern Lights generators have foam air filters which, not only filter the air, but aid in noise dampening. These filters deteriorate with heat and over time. If not changed, they will start to turn into powder and fall apart. The foam will not hurt the engine but we have seen cases where large pieces of the air filter were sucked into the intake valves. In such a case, the engine loses compression (because the intake valve will not close completely) and will not start or run. This is not only difficult to troubleshoot, but requires the removal of the cylinder head. So the $20 spent on a new air filter is a very good and wise investment. Not everyone checks injectors every year. If you are not putting a lot of hours on the generator, it starts quickly and is running clean, you might be able to skip this. But the service interval on injectors can be as low as every 700 hours (or once per year). In addition, an injector nozzle that is “squirting” rather than “spraying” can melt a piston in a very short period of time. So if you have a shop that can test the injectors, the process can offer great peace of mind. Take the time to review your Operator’s Manual or discuss its maintenance with your local dealer. Your generator was an expensive investment. If given reasonable maintenance and operated properly, your Northern Lights generator should give 20,000 hours of operation or more. But we’ve seen improperly maintained units struggle to provide half that life. Doing your Annual Maintenance is a good way of assuring that your generator will give you the reliable life expectancy Northern Lights customers have come to expect from their product. When I set out to write this blog piece I thought it would be a simple matter of writing about sound enclosures, construction materials and noise reduction. However, when I started researching these areas I quickly realized there is too much material for a single blog to be meaningful. This is therefore the first in a series of blogs on the topic of noise reduction for generators. With the continued and expanding use of diesel generator sets there has come an increased focus on controlling the noise these generators create. Whether generator sets are located in enclosures outside a facility or home, inside, on the roof or even on a yacht, designers are making more efforts to control generator set noise and vibration in order to reduce the effects on neighbours and building occupants alike. Whether generator sets run continuously in prime-power applications, intermittently in demand response applications, or occasionally in emergency standby situations or testing, their operating sound levels nearly always require remediation due to market requirements. In order to understand the solutions to reducing noise from generators, it is first necessary to understand noise. Therefore this blog provides a simple summary of noise and its characteristics, and the sources of noise created by generators. Vibrating objects induce pressure waves that travel through the air, reaching our ears as sound. Noise, by definition, is simply undesirable sound. When the amplitude of the pressure waves becomes too high, the amount of sound becomes uncomfortable. In addition to being annoying, excessive sound can cause permanent hearing damage. The following diagram explains the physiology of what happens when sound reaches the human ear. The human ear has such a wide dynamic range that the logarithmic decibel scale (dB) was devised to express sound levels in a convenient way. The ratio between the softest sound the ear can hear and the loudest sound it can experience without damage is approximately a million to one. By using a base-10 logarithmic scale, the whole range of human hearing can be described by a more convenient number that ranges from 0 dB (threshold of normal hearing) to 140 dB (the threshold of pain). There are two dB scales used to describe sound: A and L.
To adjust the sound pressure levels to more accurately reflect what the human ear perceives, the frequency-weighted dB(A) scale has been adopted as the official regulated sound level unit. It is also worth noting that the db(A) scale represents an “absolute” value. For example, stating that a generator produces 98 db(A) of noise isn’t particularly meaningful – remember by definition it can only be noise if it is undesirable to the recipient. Standing alongside a generator generating 98 db(A) of noise is completely different to standing 500 meters away (where it probably couldn’t be heard). More useful therefore is to state at what distance from the generator the noise level is experienced. As a result most generator manufacturers state sound levels in terms of db(A) @ x meters, for example 85 db(A) at 1 meter. This in turn presents challenges in terms of measurement, but that is a topic for a later blog. The principal sources of noise from generators are described below. With the advent of high-pressure common rail fuel injection, advanced turbocharging and better combustion control, manufacturers have significantly reduced overall mechanical noise from diesel engines. The amount of sound varies with the size of the engine and its load, and can be as high as 110 dB(A) measured at one meter. Engines with more cylinders have more power strokes per revolution and therefore deliver a smoother flow of power with less vibration. Smaller engines tend to be harsher in operation and produce more noise and vibration for their size. Engine exhaust is a major contributor to overall sound levels. When measured without an exhaust silencer noise can be 120 dB(A) or more depending on the size of the engine. The sound level can be reduced by up to 40 dB(A) depending on the silencer employed. Sound emanates from turbulent air as the cooling fan moves air across the engine and through the radiator. The amount of sound varies with the speed and volume of air being moved as well as with the design and distortion of the fan blades. The amount of sound can be as high as 95 dB(A) at one meter. The alternator has an internal cooling fan, and the combination of cooling air movement and brush friction produces noise. However, the sound level is always small compared to the driving engine. Current fluctuations in the alternator windings create mechanical noises that add to total noise when load demand changes. This is caused by mechanical vibration of various structural parts and components that is radiated as sound. Isolators between the engine, alternator, controls and other components help to reduce the amount of vibration that gets converted to noise. Anti-vibration mounts can also be employed to reduce noise propagation through the ground or hull where the generator is located. In this first blog we have introduced the definition of noise, described its impact on human beings and highlighted the sources of noise from generators. In the next blog we will discuss methods for attenuating these noise levels. I was helping a customer the other day who requested a heat exchanger tube stack for an M753K. This is a 10 year old generator, but I was still shocked that he needed a heat exchanger. In our experience, the only thing that can cause a heat exchanger tube stack failure on a 5-20 kw generator is very poor maintenance. When I looked up the part number for the tube stack I noticed that we had sold 3 in the last 12 months. There are, conservatively 300-400 of these generators in operation in the Caribbean, so that works out to less than a 0.75% failure rate. Most of our competitors would be envious of such a low failure rate, but we still feel that is too high. The only reason that these tube stacks are failing is because of poor maintenance practices, or using the wrong coolant. We need to educate our customers that the only proper coolant is Distilled Water, or a 50/50 premix ethylene glycol mix. If our customers want to use 100% ethylene glycol, they need to dilute it with 50% Distilled Water. Most of the water we get in the Caribbean comes from Reverse Osmosis, and that often leaves too high a mineral (including salt) content. Even with proper coolant, sludge, scale and corrosion build up over a period of time. So we recommend that our customers drain, flush and refill their cooling system every year as part of their annual maintenance. If the customer wants to extend the coolant change interval, they should purchase a pack of coolant test strips (part number 20-00005) and test their coolant every 6 months past the 1 year anniversary of the last coolant change. The coolant strips cost $15. A tube stack costs nearly $500. In addition to the tube stack failing, poor coolant quality can cause water pump failure, and the core plugs (water jackets) to corrode from the inside out. Made of a thinner, less corrosion resistant material, the core plugs can often be the “canary in the coal mine”. If they start to leak, the customer knows he has a problem. A bigger problem is that some of these core plugs can be very hard to get to in order to change them. So we need to emphasize to our customers that it is a very good investment to change their coolant every year, even if they need to hire their local dealer to do so. It can save them a lot of money down the road. 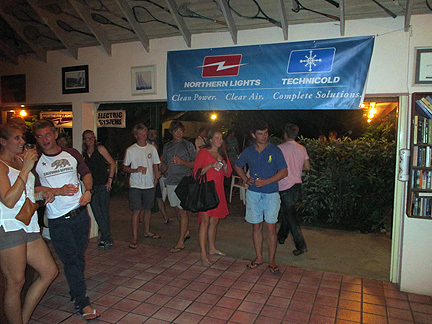 From 5-11 December members from the Northern Lights family visited customers at the Antigua Charter Yacht Meeting (ACYM). 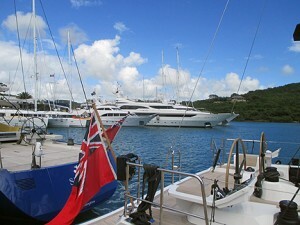 The Charter Yacht Show was very successful with 105 yachts ranging in size from 60 ft to 295 ft. In addition there were another 40-50 yachts in Falmouth Harbour which were not in the Show. Two Northern Lights representatives – Global Director of Business Development Mike Prado, and Product Development Manager Chris Krok joined Tom Gerker from NL Distributor Parts & Power visiting vessels on Falmouth Harbour Marina, the Yacht Club Marina, the Dockyard Marina and the Catamaran Marina. They found many of the yachts had Northern Lights products on them, both generators and Lugger propulsion engines. In most cases they received nothing but favorable reports from Engineers and Captains, and the crew was uniformly impressed and grateful that NL factory representatives were available to discuss their issues. A few vessels had questions or problems that Chris and Tom were able to address. In many cases they found a recurring theme that they had discovered at previous Shows. Many of the NL customers simply needed advice on how to maintain their Northern Lights equipment, and where to go to get information. They found that, in some cases, customers were overhauling their generators prematurely. Because they had owned competitor’s products in the past who recommended overhauls at 10, 15 or 20,000 hours, they felt that they had to do the same on their NL product. One customer, who had always done meticulous maintenance, overhauled his 155 kw generator at 20,000 hours. He found so little wear that he was tempted to re-use his main bearings. Chris and Tom recommended using oil analysis and valve adjustment measurements to monitor wear, as many Northern Lights generators run well past 30,000 hours with nothing but routine maintenance. Northern Lights was the only engine or generator manufacturer who attended the show, and have done so for over 15 years, to meet their customers and get their feedback on the performance of their equipment. Having the Product Development manager at the show allowed him to hear the Voice of the Customer to make changes and improvements to the current product and get an idea of what customers were looking for in future products. 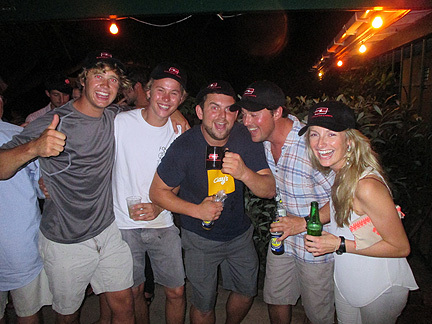 After 4 days of visiting customers, Northern Lights, along with local dealers Seagull Services and Marine Power Service, threw a Crew Party at Temo Sports. The crew were able to relax without brokers and owners present. 115 past, present and future NL customers were in attendance. Master of Ceremonies, Chris asked Trivia questions and gave out prizes to the participants. 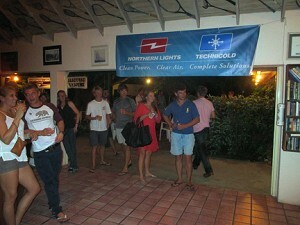 It was a great crowd of engineers and other crew who mingled with their counterparts from other yachts. Wonderful fellowship was shared and a good time was had by all. The friendly staff at Temo Sports, as they have for many years, kept the drinks flowing and the crowd happy. If you mention the words “emissions regulations” to anyone in the diesel engine industry, you will usually detect a noticeable cringing on their part. It is followed by bad news that is sometimes downright distressing. Yet the news is not all bad. As far as the effect of EPA Emissions Regulations on Northern Lights Marine Generators the good news is that the product line under 40 kWw, which constitutes the majority of the product in the Caribbean, remains largely unchanged (IMO has no regulations for engines below 175 hp). The M673LD3 (5 kW @ 60 Hz) through the M844LW3 will not see any changes for the foreseeable future. The M944T will be changed to the M944T3. The only outwardly apparent difference will be a rating change from 38 kW to 40 kw in 3 phase configurations, but the 1 phase rating will remain at 38kW. The 30 kW (M944W3) is an unfortunate victim of the tightened emissions threshold. The engine cannot achieve emissions regulations at 60 Hz, but the 50 Hz version at 26 kW remains a viable and available product for appropriate applications. The 25kW-40kW rating gap (at 60Hz) is recognized as being a significant hurdle, and Northern Lights’ product development team is actively seeking alternatives to close this gap and fill out the product line. Above 40 kW, the news remains largely good for any vessel under 500 gross tons as the Northern Lights product line meets emissions standards without after treatment. Beginning in 2016, vessels above 500 gross tons will need after treatment (in the form of SCR: Selective Catalytic Reduction) to achieve the NOX levels set by the IMO. Thankfully, most of us dodge the after treatment bullet until the regulations again change in 2021 for sub-500gt vessels. After that, any vessel with an engine producing 127 kW or greater will be required to have after treatment for NOX. However, Northern Lights will continue to stay ahead of the emissions technology curve and is already working to provide a fully-compliant package for the upcoming regulations around the world. Interestingly IMO is not addressing “soot”, the bane of most marine diesel engine owners. Despite that, Northern Lights has been addressing soot for many years. Some may remember the old STARS units (Soot Trap And Regeneration System). It was very effective for treating soot in exhaust. It used heaters that doubled as a load bank and also heated the exhaust gas to a level where it could be catalyzed. Due to problems, mostly dealing with misapplication and maintenance, the product line was discontinued some years ago. Today’s solution is called a Diesel Particulate Filter (DPF) that does not need heaters. The DPF does need to be closely matched to the engine though to make sure that the generator Exhaust Gas Temperature (EGT) is high enough to be properly catalyzed. With the benefit of less complicated systems to clean our exhaust, comes the burden to periodically clean the catalytic “brick”. More maintenance! However, the fact that DPF technology has been widely adopted in both on-highway and industrial applications means that there are a number of outlets for DPF filter cleaning in most ports of call around the world. So, it could be worse, as they say. Most of us can continue to use our generators in the manner that we have been accustomed to, due to some engineering magic done by Northern Lights. But changes will be felt by the larger yacht owner and crew. Years of experience has taught us that as soon as we learn to comply with the new regulations, there will be more on the horizon. However, the progressive team at Northern Lights will continually strive to keep us ahead of the regulatory curve, no matter what new challenges come our way!